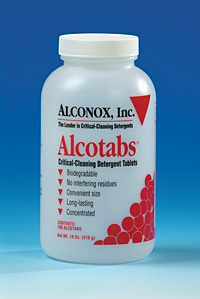 Alcotabs Critical Cleaning Detergent Tablets | Alconox, Inc.
Used to clean: Pipettes and tubes with syphon pipette washers in hospitals, clinical, educational, R&D and industrial laboratories and cosmetics manufacturing. Authorized by FSANZ and USDA for inspected meat and poultry plants. Passes inhibitory residue test for water analysis. Passes inhibitory residue test for water analysis. Used to remove: Soil, grit, grime, grease, fats, oils, blood, tissue, salt deposits, particulates, chemicals, solvents and radioisotopes. Surfaces cleaned: Corrosion inhibited formulation recommended for glass, metal, stainless steel, porcelain, ceramic, plastic, rubber and fiberglass. Can be used on soft metals such as copper, aluminum, zinc and magnesium if rinsed promptly. Corrosion testing may be advisable. Directions: To wash pipettes in syphon-type washers: Submerge pipettes immediately after use in a 1% Alconox, Liquinox, or Tergazyme solution. Let soak in jar until enough pipettes accumulate to fill holder. Drop 2 Alcotabs into the rinser. Place the holder with pipettes into rinser. Alcotab will dissolve (in cold or warm water) and effervesce, producing a detergent solution that passes up and down through the bores and around the pipettes. Rinsing automatically follows after the tablet has dissolved. For analytical or tissue culture work, use distilled, deionized, or purified water for all or final rinse. For food contact surfaces, rinse with potable water.